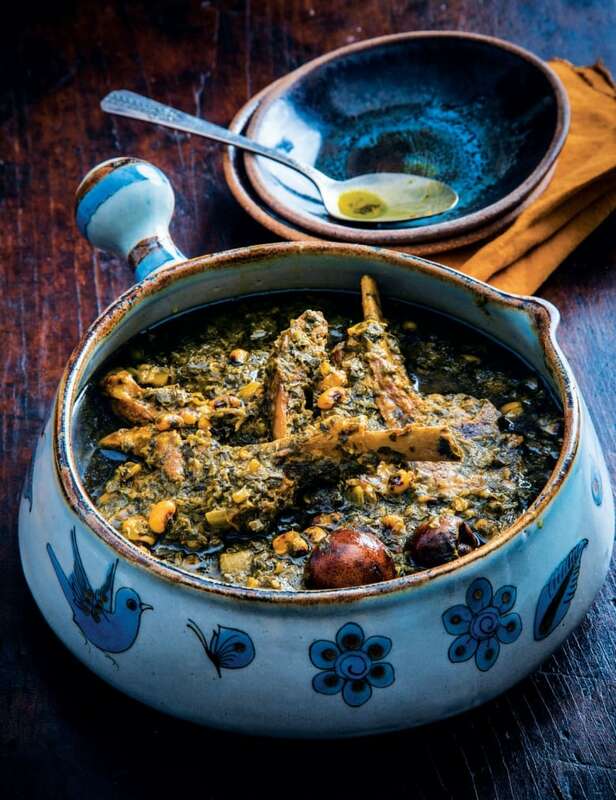 Naz Deravian’s take on this traditional Persian dish is filled with lamb, greens and all sorts of aromatic spices. We love discovering a recipe that seems to perfectly suit the season we’re in, and this Persian stew from Naz Deravian’s cookbook Bottom of the Pot is a great example of that. Called Khoresh Ghormeh Sabzi, the dish is filled with lamb, black-eyed peas and loads of herbs and spices, making it filling enough to satisfy on cool nights but still so fresh-tasting — the exact combination we crave in the spring. While some ingredients, like limoo Omani, may not be available at your local supermarket, you’ll be able to pick them up from most Middle Eastern grocery stores. Beloved internationally, Khoresh Gormeh Sabzi could very well be the national dish of Iran. And understandably so, with its distinct Persian flavors and ingredients: a field of fresh herbs, succulent meat, dried limes, beans, the ever-present duo of saffron and turmeric, and woodsy, bitter fenugreek. Fenugreek — shanbalileh — is one of the defining flavors and aro­mas of Khoresh Ghormeh Sabzi. You can find fresh fenugreek at Iranian, Middle Eastern, and Indian markets, and dried fenugreek is available at most grocery stores. This is a Sunday supper kind of meal where the stew can lazily simmer away for a few hours and fill the house with the scents of the true embodiment of an Iranian khoresh. In the Azari tradition and in homage to my mother’s family (from Azarbaijan) I use black-eyed peas instead of the more commonly used red kidney beans. And please do not retreat at the sight of the abundance of fresh green herbs used in this stew; see Prep Ahead for advice on sorting through your herbs. In a large pot or Dutch oven, heat ¼ cup of the olive oil over medium-high heat. Add the onion, and cook, stirring frequently, until golden brown, about 8 minutes. Sprinkle with a little salt, and reduce the heat to medium. Add the meat, turmeric, 1½ tea­spoons salt, and ¼ teaspoon pepper. Cook for 5 minutes, stirring often, until the meat takes on some color. Add 3 cups hot water and bring to a gentle boil. Cover, reduce the heat to low, and simmer until the meat is tender, about 30 minutes for stewing meat, longer if the meat is on the bone. Meanwhile, in a large pan, heat the remaining ¼ cup of olive oil over medium heat. Add the parsley, cilantro, green onions, and fenugreek. Cook, stirring often, until fragrant and reduced in volume, about 20 minutes. Add more oil if necessary and take care not to burn the herbs. Sprinkle with a little salt and set aside. While the meat simmers and the herbs cook, prepare the black-eyed peas. Place the black-eyed peas in a small pot and cover with 2¼ cups water and ½ teaspoon salt. Partially cover and bring to a gentle boil, reduce the heat to medium-low, and simmer for 10 to 15 minutes, until the beans have softened but not completely cooked through. They will finish cooking through in the stew. Set aside. Turn up the heat under the meat to medium. Add the herb mixture, the beans and their cooking water, the saffron water, the limoo Omani and 1 ½ teaspoons salt. Bring to a gentle boil, reduce the heat to low, partially cover, and simmer for 1 hour. Add the lemon juice and continue simmering until the meat is tender, the beans are cooked through but holding their shape, and all the flavors have fallen in love, 30 minutes to 1 hour. The longer the stew simmers, the more flavorful it will be. Just keep an eye on the beans, so they keep their shape and don’t turn mushy. As the stew simmers gently press down on the dried limes with the back of a spoon so they release their juices. Repeat this a couple of times. Taste as you go. If the stew needs more of a pucker, add more lemon juice accord­ingly. Add more water if necessary to make it juicier, or remove the lid to reduce the liquid. This khoresh shouldn’t be too watered-down, but there should be plenty of juices for everyone to spoon over their rice. MAKE AHEAD: Make the khoresh 1 day in advance, to allow the flavors to meld. Add more water when reheating and adjust the salt and lemon juice accordingly. PREP AHEAD: The fresh herbs can be prepped 1 day ahead and stored in the fridge. The onion and the meat can also be cut and stored in separate airtight containers one day ahead in the fridge. The herb mixture can be parcooked and stored in the fridge (up to 3 days) or in the freezer (up to 3 months). Thaw and add to the stew as indicated. PLAN AHEAD: Makes for great leftovers. Adjust the water and seasoning when reheating. Freeze for up to 3 months. Excerpted Bottom of the Pot: Persian Recipes and Stories by Naz Deravian. Copyright © 2018 by Naz Deravian. Reprinted with permission from Flatiron Books. All rights reserved. Photography by Eric Wolfinger.